On this date in 1939 Nazi Germany and Fascist Italy signed the “Pact of Steel,” which tied the two dictator­ships in a ten-year mili­tary alli­ance and stipu­lated that neither side could make peace with­out the other’s con­sent. Omi­nously dubbed the “Pact of Blood” in the planning stage, the alli­ance marked the for­mal crea­tion of the Rome-Berlin Axis, simul­ta­ne­ously giving Ital­ian strong­man Benito Mus­so­lini an ally sym­pa­thetic to his impe­rial am­bi­tions in the Bal­kans and East Africa and Nazi dicta­tor Adolf Hitler the abi­lity to respond to poli­cies of en­circle­ment directed against his coun­try by the Western democracies—Great Britain, France, and Poland. Mus­so­lini had rejected a for­mal alli­ance sev­eral times ear­lier and was ner­vous even now: at the very moment, Hitler was beginning to con­front Poland over the “prob­lem of Ger­man-speaking Dan­zig” (now Gdańsk) and free­dom-of-transit issues through the “Polish Corri­dor,” the post-World War I creation that gave Poland access to the Baltic Sea while it split German Prus­sia in two. (Before World War I Poles lived in a nation parti­tioned between Austro-Hun­gary, the Ger­man Empire, and the Rus­sian Empire.) Even after Ger­many had solved its Polish prob­lems by wiping Poland off the map in Sep­tem­ber 1939, it wasn’t until June 10, 1940, when Ger­man vic­tory in France, Bel­gium, and the Nether­lands was beyond doubt, that Italy owned up to its treaty obli­ga­tions and entered the con­flict by declaring war on France and Great Britain. For the pre­da­tory Muss­olini and his nation, June 10 was a tragic mis­step. Poor planning would soon cause Ital­ian defeats in Greece, while Axis cam­paigns in Africa and the Soviet Union shattered the Ital­ian mili­tary. Following the July 1943 Allied inva­sion of Sicily, Italy (Oper­a­tion Husky), Musso­lini was ousted from power and jailed. Hitler reacted with a ven­geance, rescuing Musso­lini from his deten­tion and occupying the north­ern half of Italy, where he in­stalled Musso­lini at the head of the pup­pet Repub­blica Sociale Ital­iana (RSI). The south was governed by mon­ar­chist and lib­eral forces that fought on the side of the Allies, helped by about 350,000 par­ti­sans of various stripes who ranged over Fascist and Nazi-occu­pied Italy. Nearly half a million Ital­ians, com­ba­tants and non­com­batants, died between June 10, 1940, and May 1945. Above: Map of Benito Mussolini’s Fascist Italian Social Republic (Repub­blica Sociale Ital­iana [RSI], infor­mally known as “Salò Republic”) in the second half of 1943 (yellow and green). The green-shaded areas in Northeast Italy (Oper­a­tional Zone Al­pine Foot­hills [OZAV] and Oper­a­tional Zone Adri­atic Coast [OZAK]) were Ger­man mili­tary zones that were offi­cially part of the RSI, though they were in fact effec­tively under direct Ger­man admin­is­tra­tion. Musso­lini’s seat of govern­ment, Salò (under­lined), was with­in miles of the OZAV. 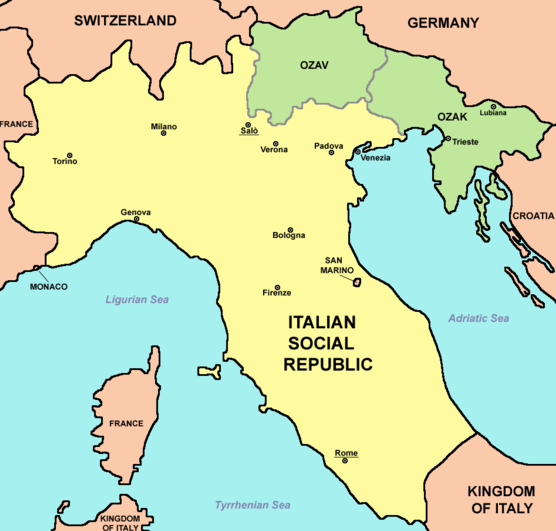 Areas to the south of the Italian Social Republic were in the hands of the Western Allies and the post-Mus­so­lini Italian government. 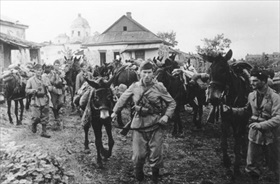 Left: Italian soldiers on the East­ern Front, July 1942. At its peak Musso­lini’s army contributed 2.5 mil­lion troops to the Axis war effort. From the start of the Ital­ian cam­paign on the East­ern Front in mid-1941 to the Eight Army’s with­drawal in 1943, Ital­ians suffered 75,000 killed; another 54,000 would die in Soviet cap­tivity. Ital­ian ranks had been reduced from a height of 230,000 men in July 1942 to 150,000 men eight months later, and of these 34,000 were wounded. The dis­aster in Rus­sia (Ital­ian sol­diers lacked heavy arms, equip­ment, ammu­ni­tion, and pro­vi­sions), followed swiftly by the rout in North Africa in May 1943 (Axis losses were close to 350,000 in dead and pri­soners), sank the Pact of Steel, leading the Grand Coun­cil of Fas­cism in Rome to remove Musso­lini as head of government on July 25, 1943. 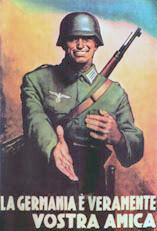 Right: A poster from Mussolini’s collab­o­ra­tionist RSI govern­ment pro­claims “Ger­many is truly your friend.” After the Wehr­macht ruth­lessly dis­armed and in­terned the Ital­ian Army in Sep­tem­ber 1943 until the end of the war in May 1945 Ital­ian troops fought on both sides: with Musso­lini’s National Repub­lican Army (Eser­cito Nazionale Repub­bli­cano, 52,000 men) or with Marshal Pietro Badog­lio’s Allied “Co-Bellig­er­ent Forces” (Eser­cito Cobellige­rante Ital­iano, 50,000 men at its height). 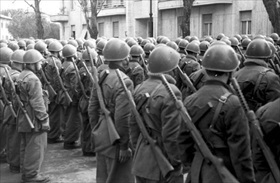 In German-occupied Italy (RSI), the partisan movement fielded 350,000 fighters. Left: Rome, Italy, March 1944. RSI naval com­mandos being reviewed by a gen­eral of the Luft­waffe prior to deploy­ment along the Allied beach­head at An­zio and Net­tuno, south of Rome. The com­man­dos, fighting as allies of the Ger­mans, were in­tensely anti-Semi­tic in the wake of strong Nazi influ­ence and answered Musso­lini’s call to defend the terri­torial integ­rity of Italy against the Allies. 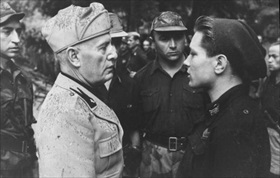 Right: Mussolini speaking to an adoles­cent mem­ber of one of the Fascist para­mili­tary Black Bri­gades (Brigate Nere), 1944. The majority of bri­gade mem­bers wore Ital­ian Army ski caps or berets dyed black, replaced their stan­dard-issue Ital­ian Army shirt for a black shirt as a sym­bol of loyalty to Muss­olini, and gen­erally parti­ci­pated in anti-par­tisan acti­vities. The badge or insig­nia of the Black Brigades was the jawless death’s head.